You can’t out run your genes. Or, in my case, it would be my shorts. 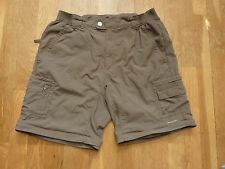 I am always on the lookout for the perfect pair of hiking shorts. It’s more difficult than it sounds. I’m height-challenged so finding shorts is hard because when hiking I don’t like the shorts to rub on the top of my knees. I was at Bass Pro Shop when I found my dream shorts. They were dark brown which meant they would go with a lot of my T-shirts. Color coordinating my outfits is imperative. I remember the day I discovered that they didn’t have Garanimals for Grown-ups. I had a panic attack. How would I know what went with what? The dream shorts were made out of the soft, super light, windproof, rain repellant fabric—the ultimate hiking apparel. It was love at first sight. I wore them constantly. They were like being near naked yet clothed. I still love them. I still wear them despite what happened. I’ve resolved myself to my fate. It’s not all that bad. My father has nice legs. He’s eighty-two and he still has nice legs. The revelation occurred while waiting for Emma outside a store in the mall. I caught a reflection of myself in the glass. I could only see myself from the hips down. With the shorts on and cross trainers, my pockets a little sprung, I saw my father’s legs. I looked around. My father was 1300 miles away but his legs were staring back at me. Holy crap! When did this happen? How had I not noticed? Was it all the walking I’d been doing? All the yoga Layce made me do? The Indo board, the squats and calf raises while waiting for my coffee to get zapped in the microwave? Whatever it was I now had my father’s legs. Despite gender, genetics had won out. The perfect brown hiking shorts had brought this to light. I am my father’s daughter. It was a proven fact—you do become your parents eventually.